Because of his ties to Alien Voices, Signet Classic asked Leonard Nimoy to write an afterword for their 2003 publication of Jules Verne's A Journey to the Center of the Earth. I call her Amazing Grace. She rejects that name and denies that she is amazing, but I insist, because she is. 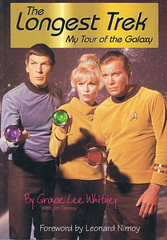 There have been countless books written about Star Trek - many, perhaps too many, by those who were actively involved. I've done two myself. But until now (and I admit I haven't read each and every one of them), I would place a large bet that no one has written as personal, moving, and powerful a one as Grace has written. If you think this is simply another book of Star Trek anecdotes and inside jokes, take a deep breath and plunge in. This is a Star Trek book which will transform people's lives. It will give insight into a human condition and guidance to many in need. lt is a blessing to all of us that she has put this life of hers to such generous use. My thanks to Grace—always amazing. 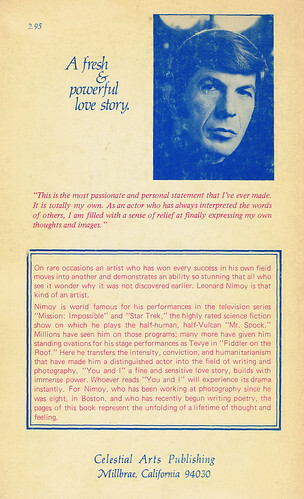 Article written by Mr. Nimoy for Datsun Dicovery. Touching on subjects like his photography, poetry, In Search Of... TV series and more. In 1970, I renewed an old love. I turned with a new intensity toward the art of photography. I had been interested in photography as a hobby for many years, had always owned a camera, and sometimes when a darkroom was available, processed my own prints. But I had never approached the work at a more serious level than simply recording events such as birthday parties and other celebrations of various kinds. Now I was intrigued with photography as an art form, particularly in black and white. I took some UCLA courses and began to understand the science of photography as an art form. I worked intensely until I was satisfied that my prints were suitable for publication. 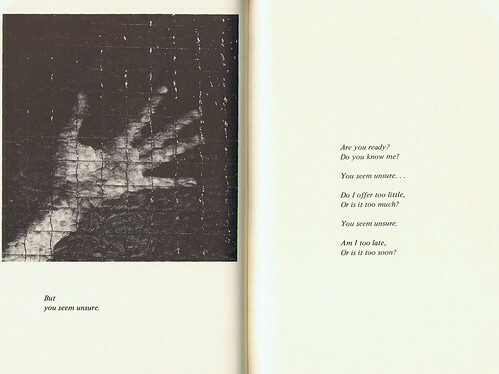 Now I realized that the form of publication was a major choice and decided that perhaps the format that would serve me best would be a book of photographs and words. For the first time in my life, I sat down seriously to think and write poetically. It was surprisingly easy. Or I should say it came in an unexpectedly gratifying flow. My search for an understanding of the art of photography had led me to a new surprise. That I was capable of writing and being published successfully as a poet. 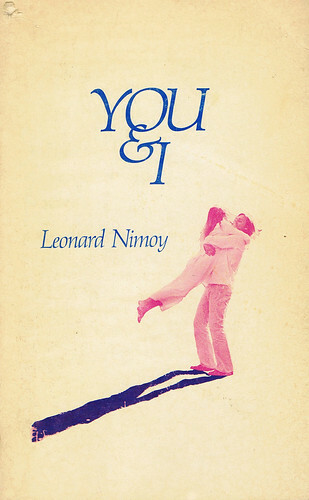 Since that first book which was called, "YOU & I," I have had four other books published, all quite successful. 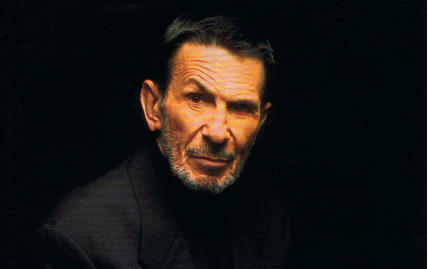 (1) Van Hise, James, "An Evening With Leonard Nimoy" in Star Trek 74, SFCA, Miami, 1974.